The majority of yachts are mono-hulled but a noticeable enthusiastic minority of cruisers favour their multi-hulled yachts. The mono hull enthusiasts claim ultimate stability and recovery capability in case of a knock down or even a roll. The multi-hull sailors, in particular the catamaran sailors, enjoy their stable platform often claiming that glasses of wine stay on the table under all conditions but ultimate stability is only achieved upside down which of course only happens in extremis in races. Access to shallow places is a definite plus point. Concrete as a building material has mainly been used by DIY builders but with very little success and not to be recommended. Most modern yachts are built in GRP quite a few in steel, alloy or wood. Wood is a very old building material but has a future in the form of wood-epoxy which makes it impervious to worms and pests. Steel and alloy are popular building materials in France and northern Europe, particularly for the bigger one off yachts. The shape of hulls has changed remarkably over the years and is prone to racing rules and fashion. The latest fashion being a straight bow and an aft sloping stern. This straight bow may increase the waterline length and hence the speed but it is not good for anchoring. And anchoring is part and parcel of cruising. This one will not survive sideways loading in a swell. To prevent the anchor denting the bow a bowsprit or platform with a roller is often built out well forward of the bow. This construction needs to be very strong since the loadings can be heavy when anchored in a swell or when swinging sideways at anchor. A moderate spoon shaped bow has great advantage there. The sloping stern, preferably accessible from the cockpit is good for boarding the boat from the dinghy or when fitted with a ladder after a swim, in which case fitting a wind vane could be problematic. Under water shapes changed considerably as well. The long keel of the classic yacht is now superseded by the fin and skeg configuration. An important requirement is that both configurations allow the yacht to track easily when sailing downwind. 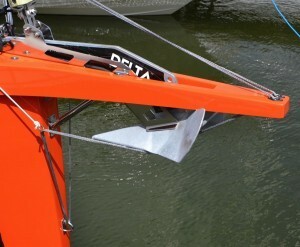 A properly sized skeg not only supports the rudder but improves the tracking when sailing downwind. 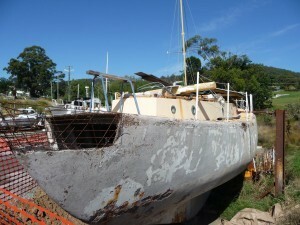 The long keel is an extension of the hull and therefore a very strong construction which gives the inside a deep bilge. 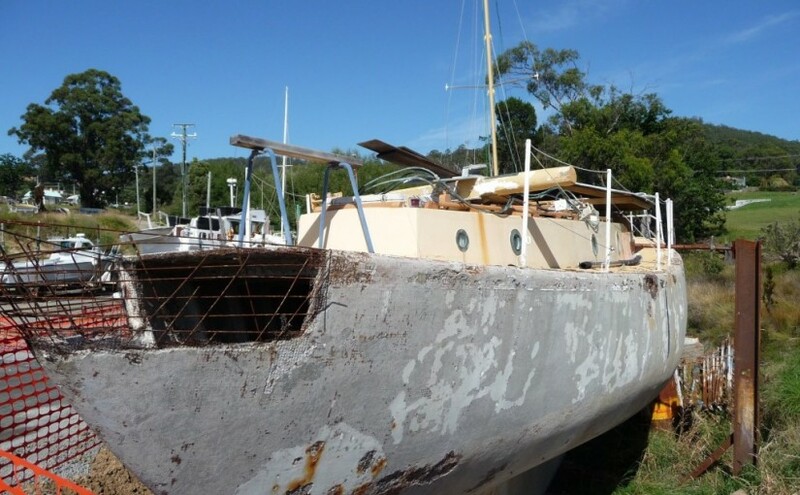 The modern fin keel bolted on to a U-shaped hull looks more vulnerable when touching the ground and doesn’t often allow for a bilge creating a problem with even very little water inside the hull.